In making planning decisions about potentially contaminated land (PCL) councils must decide whether the land is suitable for the proposed use and development. Planning policy encouraging urban consolidation and increasing property values are leading to the transformation of former industrial land to residential and other sensitive uses. However, the potential restrictions on land-use and the costs of investigating, remediating and redeveloping contaminated land can be significant. In making planning decisions about PCL, councils often face significant pressure to be commercial and practical, and to balance other planning objectives in performing legal obligations associated with PCL. At the same time, as a number of cases before the courts have demonstrated, councils can also face significant legal liability (and expensive and time-consuming litigation) if statutory obligations relating to PCL are not properly performed. The regulatory framework for PCL in Victoria is mature, having developed over the past 20 years following amendments to the Planning and Environment Act 1987 (Vic) and the introduction of Ministerial Direction No 1 – Potentially Contaminated Land on 9 October 1989. However, further work is required to improve some aspects of the regulatory framework, give clearer guidance to councils in making decisions about PCL and avoid the uncertainty created by some recent decisions reviewed by the Victorian Civil and Administrative Tribunal. 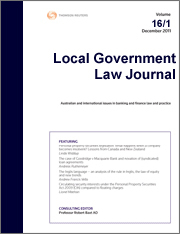 The full article can be accessed here: “Potentially contaminated land in Victoria – challenges for local government” (2010) 15 LGLJ 170.